Its only been within the past year that I’ve begun to come around to carbon wheels. Really, aluminum is tough to beat for a rim material. It’s cheap, light and, depending on the rim, can take a serious beating. Thanks to disc brakes, you can dent the hell out of an aluminum hoop before it retires to its second life as a wind chime. Carbon on the other hand, is expensive, and when it breaks it’s probably not the best idea to continue riding it. The upside of this is that carbon rim sections make a sweet sound when clanking together in the wind on the porch. It’s tough to have confidence in carbon wheels when considering the complex ratio of price, to performance advantages, to proximity to rocks. So what are plastic hoops good at besides showing that you have disposable income? Acceleration, acceleration, acceleration. Carbon rims are stiff and generally a bit lighter than an aluminum rim in the same category. 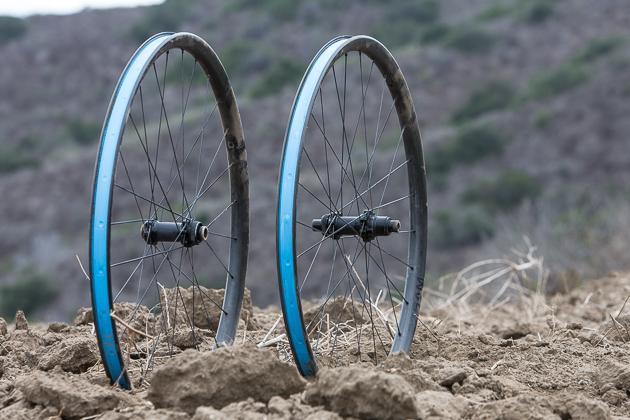 The 650b Reynolds Blacklabel AM wheels weigh in at about 1,580 grams with tape and valves–pretty svelte for the all-mountain category–meaning that they’ll make your big squish bike accelerate like an XC racer. 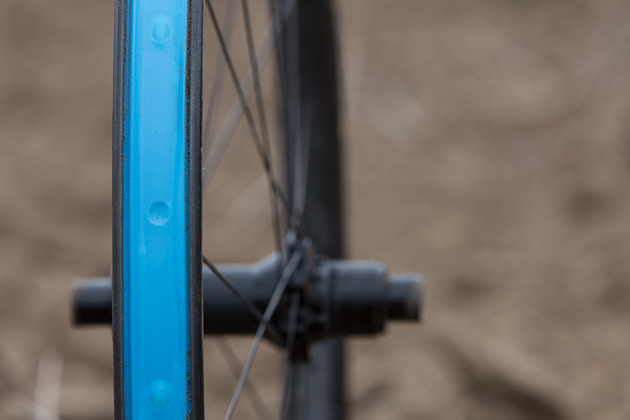 It’s not the widest rim out there, but the Reynolds shook off impacts better than some of today’s most popular carbon hoops. The Blacklabel rims have an inner width of 23 millimeters, which is pretty narrow when compared to the numerous 28 to 30-millimeter hoops hitting the market, but something I had zero issue with. I ran the 2.3-inch Michelin Wild Rock’R 2 Reinforced tires–tires so burly that they weigh more than the wheels themselves. 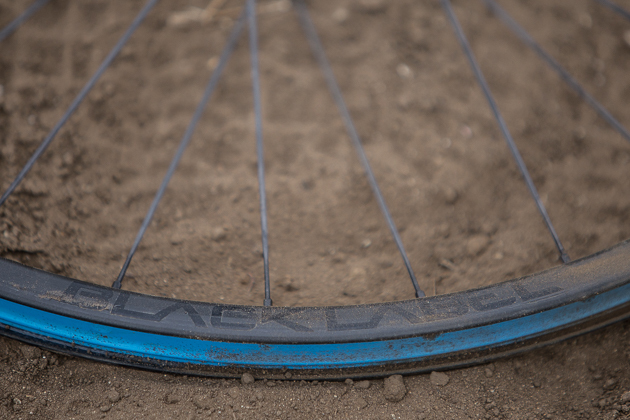 They set up tubeless easily, and the aggressive ridge in the rim profile provided a secure bead lock. The best part was that, despite having what are essentially downhill tires with a foldable bead, my bike felt fast. I should have been bogged down everywhere except descending, but had no problems with rough and technical sections requiring quick power boosts. In short, these wheels allowed me to up the gnar factor at the tire while mitigating the downfalls of lugging giant lugs around. Everyone talks about stiffness as if stiffer is always better. It’s not. When wheels are too stiff they deflect off things instead of holding the line and absorbing the energy. Did you know that World Cup downhill racers tune their wheel stiffness by adjusting spoke tension to suit certain courses? Optimizing wheel stiffness can improve traction, control and comfort. Reynolds has done an excellent job at this with the Blacklabel wheels. For me, they strike a great balance between providing stable, yet supple ride–something I appreciated after experiencing how harsh some of the other carbon wheels on the market can be. 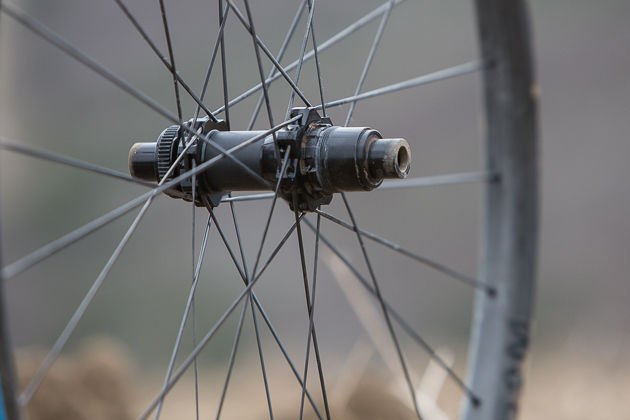 DT Swiss 240 hubs are some of the most reliable on the market. Center Lock rotor mounts create a nice, clean look and allow for super quick rotor changes. The build–DT Swiss 240 Center Lock hubs and DT Aerolite straight pull spokes–definitely help create the ride properties that I enjoyed. Straight pull spokes, since there’s no bend at the hub end, have more opportunity to unload during big impacts and g-outs, helping to create the forgiveness of the wheels. The downside is that all this loading and unloading makes the spokes sing a bit. Out-of-the-saddle climbing efforts and aggressive cornering would result in some “pinging” sounds coming from the spokes. Reynolds recommended that I increase the spoke tension a bit to get rid of the noise but I was afraid that would also get rid of the flex I liked, so I let the wheels sing to me. If you’re considering messing with the spoke tension on your wheels, contact the manufacturer for the recommended range and have a qualified wheel builder do the work. The subdued graphics of these top-tier wheels did not go unnoticed. I was impressed by the durability of the Blacklabel AM rims. They survived a week at the Whistler Bike Park with nothing more than a few scuffs–and I was not easy on them. They resisted bottom-outs that would have buckled all but the most DH-specific aluminum hoops. I tried to break the things by running far less pressure than I should have and smashing through rock gardens. The wheels escaped without a mark–which is why they’re my pick of the week.